A killer was stalking Chicago in the fall of 1918, a killer called the Spanish flu. The city had never seen anything like it. On this October 17th — on this one day alone — 381 Chicagoans died. Nine decades later, scientists still argue over the origins of the disease. 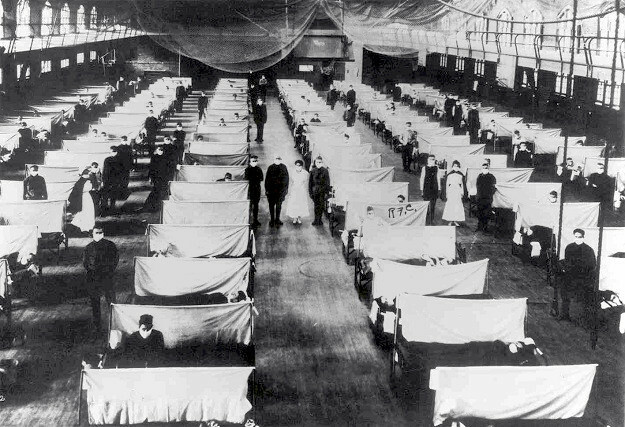 We do know that the worldwide 1918 flu was the deadliest pandemic since the Black Death. Over 40 million people died — four times the number killed in World War I. In the United States, flu fatalities were 600,000. Unlike the usual pattern, most of the victims were not the very young or the very old. Healthy people in the prime of life were dying, and dying quickly — often within hours of showing symptoms. In Chicago, health commissioner John Dill Robertson decided on drastic actions. The disease spread through close human contact. Therefore, all large gatherings were banned — athletic contests, labor and political meetings, banquets and so on. Schools shut down, and children playing in the parks were told to go home. Theaters and cabarets closed. Weddings were postponed, and even funerals were suspended. Because they were considered essential for morale, churches remained open. However, Robertson requested that pastors shorten their services. Even so, attendance at religious events was down about one-third. Most people had to continue working, so officials asked businesses to stagger their hours. Robertson suggested that commuters walk whenever possible, to avoid overcrowding on public transportation. Laws were passed to ban public spitting and to outlaw smoking on "L" trains. Citizens were asked to wear gauze face masks when they appeared in public. 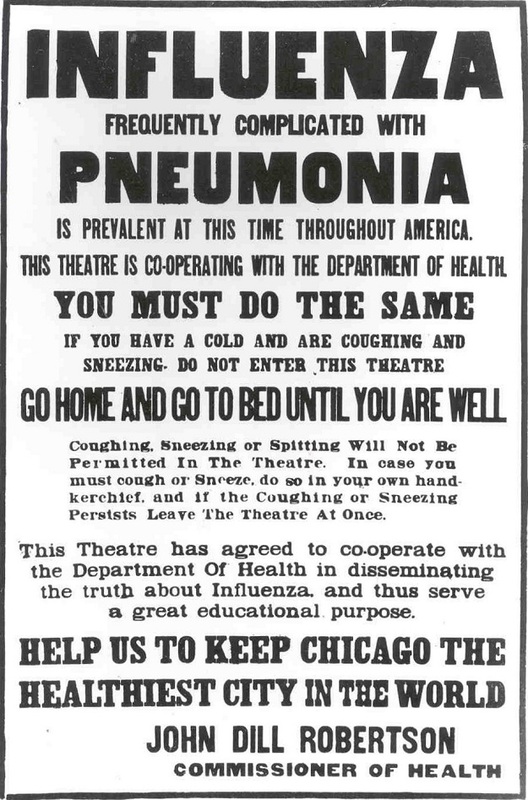 By October 21, Chicago had received 100,000 doses of flu vaccine, and inoculations began. Whether this helped is debatable. But over the next weeks, flu deaths rapidly dropped. The war ended on November 11, and the Spanish flu was forgotten in the excitement. About 8,500 Chicagoans had died. Former mayor John Hopkins and pioneer educator Ella Flagg Young were the most prominent victims. And there were all the others, known only to their family and friends. Those left behind dealt with their grief. One of these was a 29-year-old Bucktown bricklayer named Florian Przedziankowski. In October 1918 he lost both his wife and his mother to the deadly flu. But Florian moved on, as he had to. In 1920 he remarried, and a year later, he had a daughter. And that daughter became my mother.